Yea....that last word throws you for a loop doesn't it? And yet it is the perfect way to describe Sanctum. This book is definitely unlike anything you've ever read before. 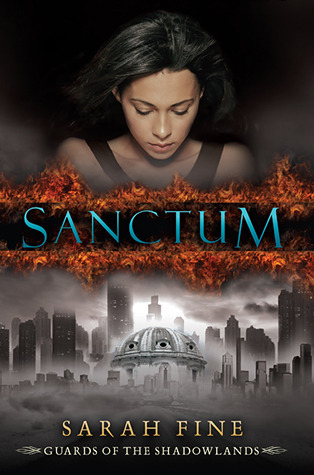 Sanctum features a girl named Lela who learns of the existence of a horrific place in Hell - a place dedicated solely to those who commit suicide. At one point in her life, Lela nearly went there herself, but was brought back from the brink at the very last second. But in an ironic twist, just one year later, when her best friend commits suicide, Lela makes it her mission to get her out of that Hell - no matter what. Along the way, Lela will meet Malachi, a guard desperately trying to get himself released from Hell. Their relationship takes many unexpected twists and turns but I adored every second of it. The two characters fell for each other pretty quickly, but it still seemed genuine and real. Watching the pair battle all of the obstacles Hell has to offer makes the book a fun and quick read. I'm looking forward to the sequel! This was a pretty good book. I loved how they became friends to begin with. The book became a little too fantasy-ish for a hot minute, I almost lost interest. I am not a fan of fanstasy books at all. Then I kept reading and all was well again. I got this book at BEA12 and it was a long time before I saw it on any blogs or anything. I think the follow up will be good too.